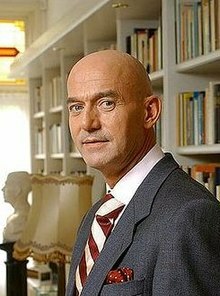 Wilhelmus Simon Petrus Fortuijn, known as Pim Fortuyn (pronounced [pɪm fɔʁtœʏn], 19 February 1948 – 6 May 2002) was a Dutch sociologist and politician. He was born in Driehuis. He was the leader of the LPF (Lijst Pim Fortuyn), a right-wing political party. He was very popular and was expected to win the 2002 elections. Nine days before the elections, he was shot dead by an animal rights activist, Volkert van der Graaf, in Hilversum. Fortuyn did not agree with some things the religion of Islam does, and did not want to let criminal Muslims from other countries come to the Netherlands. He was Roman Catholic and openly gay. Wikimedia Commons has media related to Pim Fortuyn. This page was last changed on 24 January 2018, at 14:21.